Macaroni and Cheese is an American classic. It’s practically a staple in our diets, or at least the boxed version was while growing up in the 80’s and 90’s. When craving the favorite cheese drenched pasta, how do you decide which one to make? From baked and boxed to fancier truffle and healthier spinach versions – there’s a variation to match any specific craving. 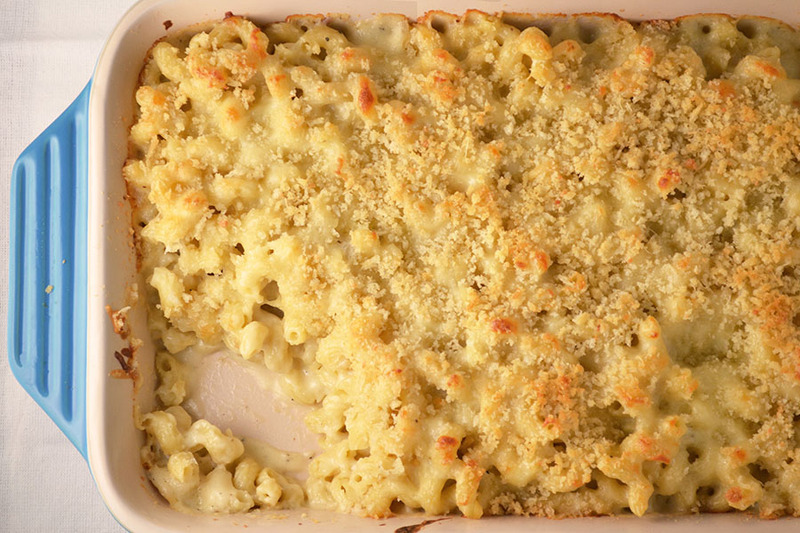 I keep it simple: if I’m craving comforting mac and cheese and willing to consume large amounts of this caloric delight for dinner, I want the real deal. Extra cheesy baked macaroni and cheese with a lightly crunchy top – no funny business. This mac and cheese recipe is not from my grandmother’s books or any of her colleagues, it’s a creation of my own. As I expand this blog to include other classic recipes besides those of my grandmothers, classic baked mac and cheese was a obvious necessity. My grandmother had very few pasta recipes – I’m not sure if this was due to the time period (1960’s), or if it was just a category she was still in the process of mastering. Either way, there are some great classic pasta recipes out there, such as mac and cheese, that I felt should be included here. Although this is a classic baked version, it is extra cheesy. This recipe includes four different types of cheeses: sharp cheddar, gruyere, parmesan, and mozzarella. Cheddar and gruyere are used in the cheese sauce and the mozzarella and parmesan are used in the gooey yet crunchy bread crumb topping. The combination of cheeses not only provides different textures but also different layers in flavor. Another minor difference between this recipe and classic mac and cheese, is the pasta. While macaroni can easily be used, I prefer cavatappi pasta. This squiggly pasta is like macaroni with ridges and an extra curl at the end. The result is more pasta and more crevices for the cheesy sauce to hide. Rich with tender noodles and melted sharp cheese, each bite will satisfy that common craving for this American tradition. Melt 2 tablespoons of the butter. Place the parmesan and bread crumbs in a small bowl and stir in the melted butter. In a large pot of boiling salted water, cook the pasta until al dente (just tender). Drain the noodles (do not rinse). In a small saucepan over moderate heat, warm the milk just until it simmers— careful not to boil. Remove from the heat. In a medium saucepan over medium heat, melt the remaining 3 tablespoons of butter. Whisk in flour. Cook just until the mixture starts to turn a golden/tan color, about 3 minutes. Slowly add the warm milk, whisking constantly until the sauce thickens, about 3 minutes. Remove from the heat and stir in the dry mustard, nutmeg, salt, and pepper. Add 5 cups grated cheddar cheese and gruyere. Stir until it's completely melted. Season to taste. Pour the cheese sauce over the cooked pasta and stir to coat the pasta in the sauce. 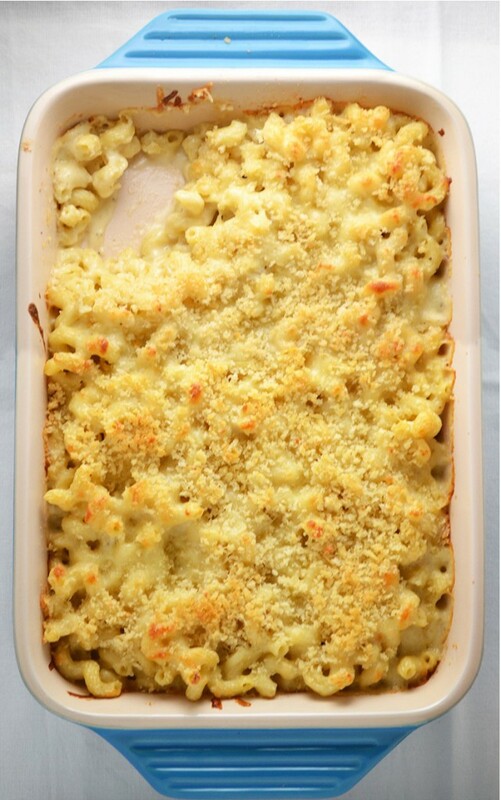 Pour the macaroni and cheese into the prepared baking dish and top with mozzarella, remaining ½ cup of cheddar and the bread crumb mixture. Bake until golden brown, about 30 minutes. This looks delicious. When do you add the gruyere? Add the gruyere along with the 5 cups of grated cheddar cheese. I’ve corrected the recipe (still getting used to this new recipe plugin). Thanks for pointing this out!